This is for anyone who works in or has witnessed a dysfunctional organization, department, or unhealthy team/board. Too many of us have battle wounds from these individuals and teams – but why do we stay? How do we manage through those experiences? “These intriguing leaders first charm but then manipulate, mistreat, undermine, and ultimately leave their followers worse off than they found them.” You may have seen this leader in your own organization. Or, worse you may not realize the toxicity some individuals are bringing to the team. This interesting book examines the dysfunctional leader’s traits, characteristics, and behaviors. Watch out. 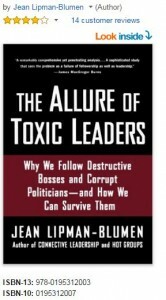 Written by Jean Lipman-Blumen, you will surely connect with the content and have a new “eyes wide open” viewpoint on leadership after reading this book.